Four Goshen College students were named the winners in a student video documentary competition held by the Peace and Justice Journalism Program, which is funded by Plowshares. Students from Earlham College, Manchester College and Goshen College were invited to submit proposals for 30-minute documentaries. South Africans continue to pick their way through the debris of apartheid that devastated the country for half a century. 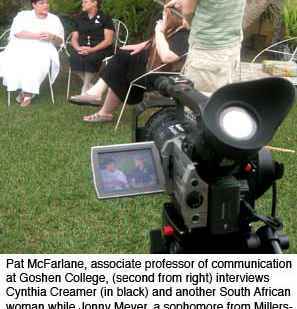 During Goshen College's May term, three students and three advisers sorted through the material they filmed during their South Africa spring break trip from Feb. 23 to March 6 choosing clips to show how churches help shape post-apartheid society. Goshen College recently recognized 212 students, for excellence in academics, on the 2005-06 spring semester Dean's List.